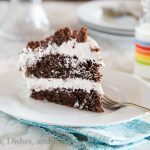 Chocolate Zucchini Cake – a rich chocolate cake topped with chocolate frosting and loaded with plenty of zucchini. They will never know it is in there! I love baking with zucchini. Zucchini recipes tend to be super tender, moist and delicious. Zucchini muffins tend to be one of our favorites when there is lots of zucchini to use up in the fall. 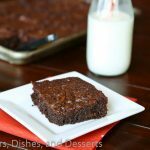 They are always stashed in the freezer for easy breakfasts. 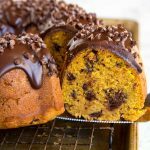 Often times people think of zucchini bread, but there is more than just bread and muffins to make! 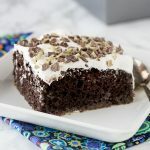 This chocolate zucchini cake is a must! It is so rich and chocolate-y, no one will ever guess there is zucchini mixed in. You can use zucchini in both sweet and savory zucchini recipes. Zucchini Fritters are great for a side dish with a spicy and tangy dipping sauce. But when you are craving dessert, zucchini cake is the way to go! 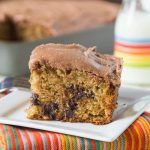 This chocolate chip zucchini cake topped with a Nutella frosting is another must try. Just depends if you want all chocolate or just a little. Zucchini has a ton of liquid in it, so you want to follow the directions on a recipe to know if you need to squeeze out some of the moisture or not. But either way, zucchini always makes for super moist and tender baking. 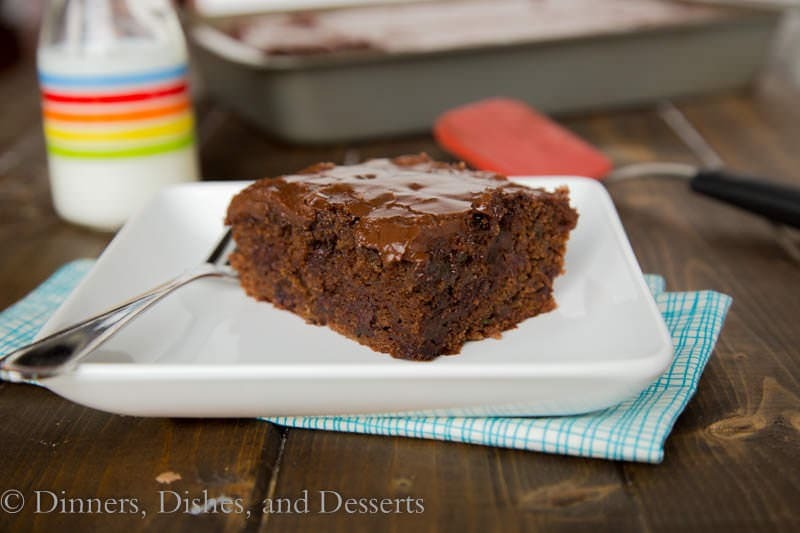 And this chocolate zucchini cake is no exception. When I shared the Creamy Zucchini, Tomato, & Ricotta Pasta, I mentioned that I had a zucchini cake coming up. Well here it is! My garden is still going crazy. I think I have 3 zucchini still out there that I need to pick, and who knows how many more are growing. You can probably guess what I will be doing this weekend. If you have picky or skeptic eaters in our house, you can peal the zucchini before grating it when you are baking. Then they will never spot any green flecks and have no idea you are giving them a zucchini cake. They will just think they are eating chocolate cake! So when you have a ton of zucchini in the garden this year, or your neighbor asks if you want an of theirs, say yes!! 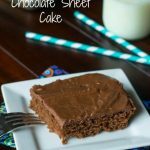 This chocolate zucchini cake is a must make! 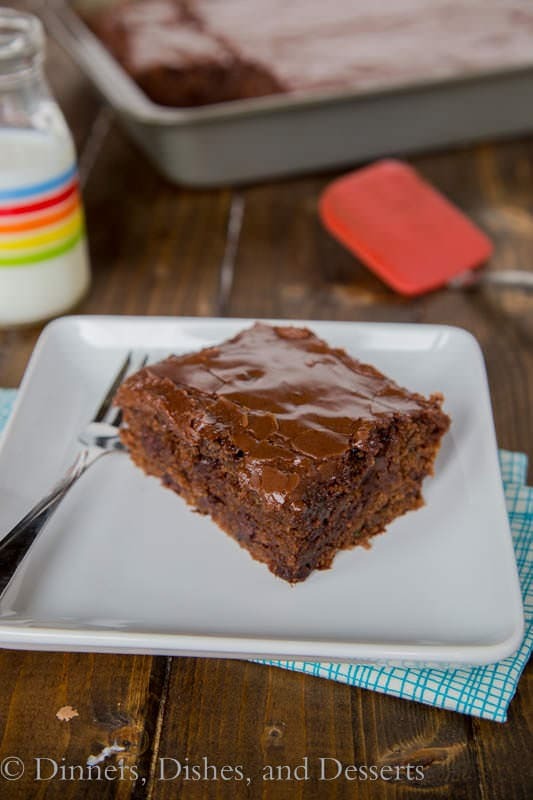 A homemade chocolate cake is the best, and when you can add some veggies to it that is just a win. I wish that justified having a second piece! 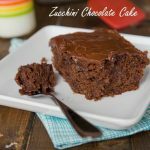 Chocolate Zucchini Cake - a rich chocolate cake topped with chocolate frosting and loaded with plenty of zucchini. They will never know it is in there! Preheat oven to 350 degrees. Spray or grease a 13x9 inch pan. Set aside. In a large bowl mix together butter, oil, sugar, vanilla, baking soda, baking powder, and salt until well combined and smooth. Add the eggs. Mix in yogurt and flour, alternating between the two. Mix in the cocoa powder until the batter is smooth. Pour into the prepared baking pan. Bake for 35-40 minutes, until a tester comes out clean. 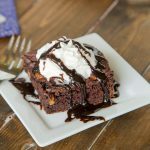 To prepare the frosting mix together all of the ingredients until smooth, and desired consistency. Add additional milk or sugar if necessary. Once the cake is cool; spread frosting over the cake. 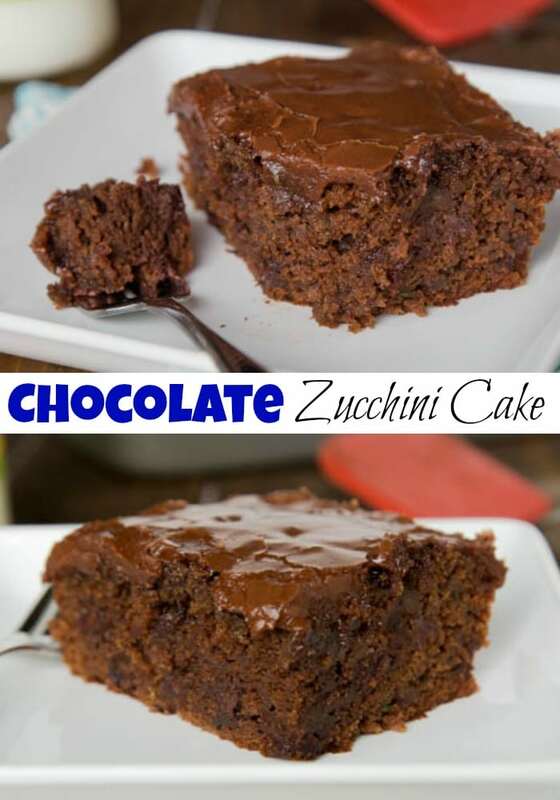 Zucchini and chocolate are just a match made in heaven! I tried to resist making sweet treats with the zucchini all year but I am ate my end with eating it other ways. Cake it is! 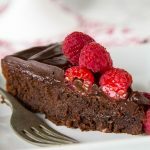 I love any kind of chocolate cake! 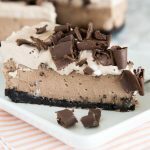 Since it has zucchini it’s totally healthy and I can have an extra slice or two right! YUM! 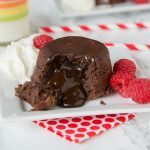 I love using chocolate and zucchini together! 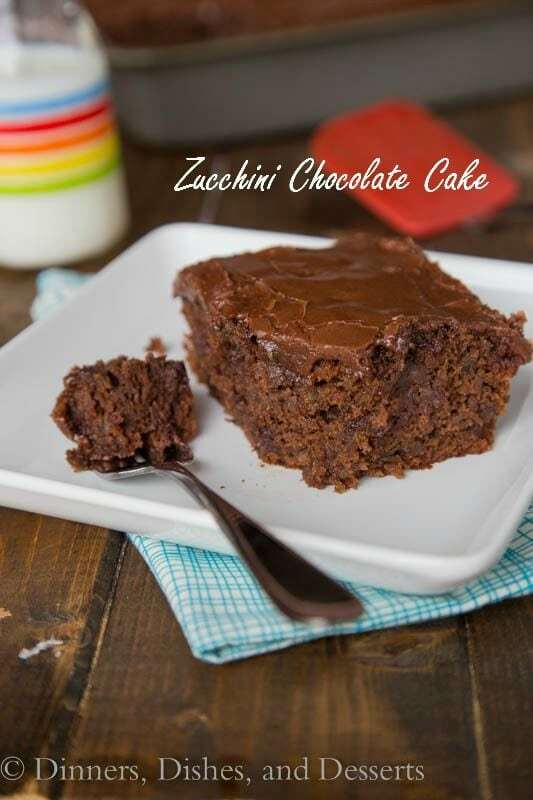 Just a quick note to let you know that I making your chocolate zucchini cake this weekend for when the neighbors come over. This sounds wonderful can’t wait to try it! 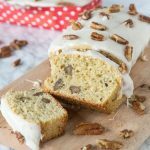 Have you ever tried making regular zucchini bread and then icing it with cream cheese icing ?It is very simliar to Carrot cake and delicious so I know I will really enjoy your recipe also because I love regular zucchini bread. 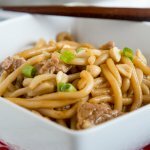 Thanks for giving us such a great recipe! I love sneaking veggies into everything! I know they’re going to eat this up and be none the wiser….looks amazing! My family adored this cake! They didn’t even realize the zucchini was there. Looks like our zucchini plant will be quite productive this year!! So bring on the zucchini cake, YUM!! 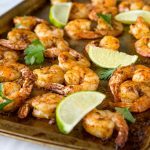 Delicious way to sneak indoor veggies! I have 2 zucchini’s the size of my arm, ready to be made into cake! I’m having a stressful week and deserve chocolate cake!!!! 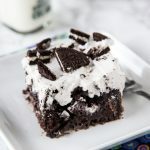 That looks so perfectly moist, yummy! 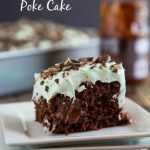 I love the texture of this cake! So delish! I would like to wake up with this for breakfast! My favorite flavor combo! Looks great! This is totally irresistible! Can’t wait to give it a try! I can’t believe that I’ve barely made anything “zucchini” this season! Weird, right? I’ve only been grilling it. Time for cake! 🙂 Looks fab!